According to the U.N.’s Food and Agriculture Organisation, the share of fish stocks within biologically sustainable levels decreased from 90% in 1974 to 68.6% in 2013. The remaining 31.4% of fish stocks are estimated to be at a biologically unsustainable level. So are we overfishing to an extent that fishes are not given enough time to grow and reproduce? Is aquaculture a solution to declining fish stock? 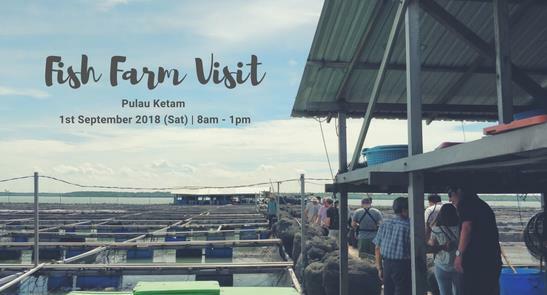 Come find out during the fish farm visit. What is environmentally friendly aquaculture or Responsible Aquaculture practices. The difference between a conventional (typical fish farm in Malaysia) and an AIP farm. Why the need for farms in Malaysia to change towards responsible aquaculture practices. You may bring a cooler box if you would like to buy some groupers or pompanos after the tour in the farm. You may bring a cooler box if you would like to buy some groupers or pompanos after the tour in the farm. Kindly whatsapp Grace Chin at 012-3274887 for the space availability or email her at gracehychin@gmail.com for enquiries. To register, please fill in the form https://goo.gl/forms/vhZiFM29oHZB1Eda2. If you are registering for your family member(s), please fill in the google form for everyone. Payment must be made within 48 hours after the submission of the google form. A copy of the bank-in slip or payment receipt must be emailed to gracehychin@gmail.com to secure a place.